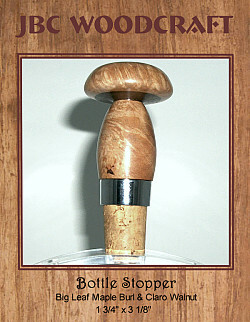 SIZE: 1 3/4" x 3 1/8"
Preserve your favorite wine with this one-of-a-kind bottle topper by JBC Woodcraft®. This unique mushroom design is handcrafted from Big Leaf Maple Burl & Claro Walnut. Traditional cork stopper with chrome band provides a classic look and airtight seal for wine bottles of most sizes.